Oakland, California is a city in flux. The rental market in San Francisco has finally gone “totally bonkers,” and this once-working-class city across the bay is filling up with young families, artists, tech refugees, and just about everyone else who wants to stay in an urban area, but can no longer afford the city across the bay. And while some praise Oakland’s diversity and “livability,” many are concerned by signs of spill-over gentrification. 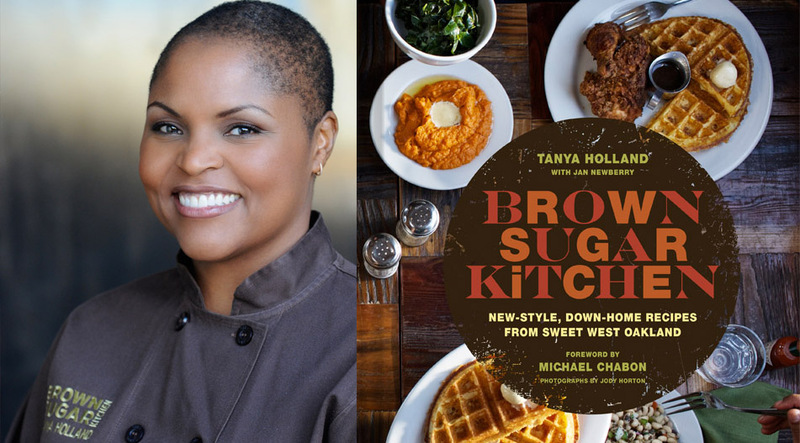 Tanya Holland is a chef at the center of the flux and if her new cookbook, Brown Sugar Kitchen: New-Style, Down-Home Recipes from Sweet West Oakland, is any indication, there’s nowhere else she’d rather be. When Holland moved to Oakland from New York City nearly several years ago, she had hopes of opening a French Bistro. When she stumbled on a space in West Oakland, where she lives, she decided to start with a casual breakfast and lunch spot. Soon Brown Sugar Kitchen was born. And almost as quickly as it entered the world, it became an institution. Holland wanted to create a concept that was accessible to people established in the neighborhood as well as those moving in from other areas. And she wanted to source real, sustainable food when possible. The chicken she uses in her now-famous chicken and waffles is hormone-free and free range. The grits are organic, and the waffles are made with local buttermilk. The sweet potatoes and collard greens often come from local growers. “We opened the doors and it took on a life of its own … People started coming in at 7:00 am asking for chicken and waffles. I was like, ‘What?! I have to start frying chicken at 6:00 am?’” Before she knew it, Holland had regulars. Without intending to, she had created the kind of place where the menu never changes, and a whole range of community members felt at home. “We realized what makes Brown Sugar Kitchen is the people,” Holland says, who co-wrote the book with Jan Newberry. “It has been really great seeing the evolution of who dines there frequently and how devoted they are to their favorite dishes.” Among those fans is Oakland author Michael Chabon, who wrote the introduction to Holland’s book, as well as a number of artists and musicians including Boots Riley, and other local characters who make appearances in its pages. Even in cities segregated far more determinedly than Oakland, I’ve noticed that a popular soul-food restaurant will often feature the most integrated tables in town–that’s one of the things I love about soul food. Bean, rice and collards are a powerful force for transformation. But the crowd’s different at BSK. More jumbled, the lines of race and class are drawn more faintly than in Oakland’s other restaurants, soul-food or otherwise. A more purposive clientele, I want to say, self-jumbled, everybody showing up with his or her own eraser to rub away at those lines a little more. B-Side also offers a wide range of low-cost vegetables and sides, which make the restaurant perfect for those who want to treat themselves to a small portion–a side-order if you will–of sustainable meat. Whether or not Holland’s restaurants can “combat gentrification,” it’s clear that accessibility and community are core values for the chef. “At first, I didn’t like the idea of a small restaurant because I worried one group of people would take it over, but that just hasn’t happened,” she says. Today’s Oakland is a complicated place, but in its best corners, it can feel like the picture of a truly diverse American city–the kind some people might be surprised to know still exists. Holland’s restaurants are some of those corners, and it shows in the pages of her book. Photographs by Jody Horton / Chronicle Books.